In this tutorial, I'll be showing you how simple it is to get a fully featured GraphQL server up and running in Node.js with Apollo Server. GraphQL is a specification and therefore language agnostic. 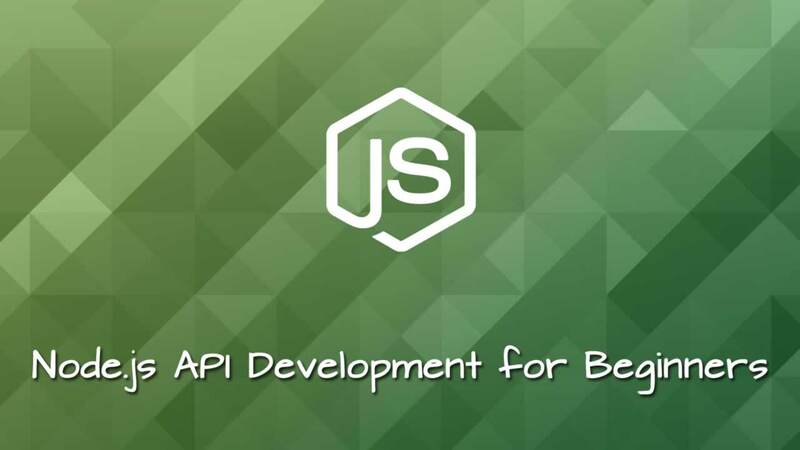 When it comes GraphQL development with node, there are various options available ranging from graphql-js, express-graphql to apollo-server. In this tutorial, I’ll be showing you how simple it is to get a fully featured GraphQL server up and running in Node.js with Apollo Server. Since the lauch of Apollo Server 2, creating GraphQL server with Apollo Server has gotten a lot easier, to to mention the other features that came with it. For the purpose of demonstration, we’ll be building a GraphQL server for a simple recipe app. GraphQL is a declarative data fetching specification and query language for APIs. It was created by Facebook. GraphQL is an effective alternative to REST, as it was created to overcome some of the shortcomings of REST like under/over fetching. Unlike REST, GraphQL uses one endpoint. So basically, we make one request to the endpoint and we’ll get one response as JSON. This JSON response can contain as little or as much data as we want. Like REST, GraphQL can be operated over HTTP, though GraphQL is protocol agnostic. A typical GraphQL server is comprised of schema and resolvers. A schema (or GraphQL schema) contains type definitions that would make up a GraphQL API. A type definition contains field(s), each with what it is expected to return. Each field is mapped to a function on the GraphQL server called a resolver. Resolvers contains the implementation logic and returns data for a field. Other words, schema contains type definition, while resolvers contains the actual implementations. 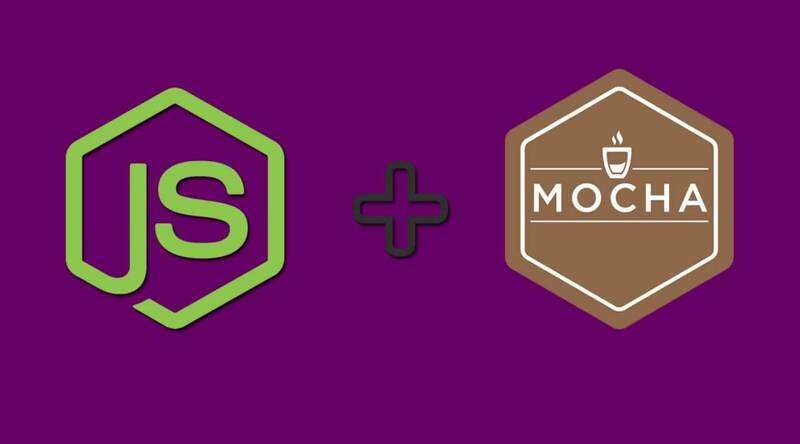 In addtion to install Sequelize, we are also installing sqlite3 package for Node.js. To help us scaffold our project, we’ll be using the Sequelize CLI, which we are installing as well. config: contains config file, which tells Sequelize how to connect with our database. models: contains all models for our project, also contains an index.js file which integrates all the models together. migrations: contains all migration files. seeders: contains all seed files. We set the dialect to sqlite and set the storage to point to a SQLite database file. This is will create a user.js file inside the models directory and a corresponding migration file inside the migrations directory. You’ll notice we have an additional field: userId, which would hold the ID of the user that created a recipe. More on this shortly. To wrap up with our models, let’s define the relationship between them. You might have guessed with the inclusion of the userId column to the recipes table, that we want to be able to associate a recipe to a user and vice-versa. 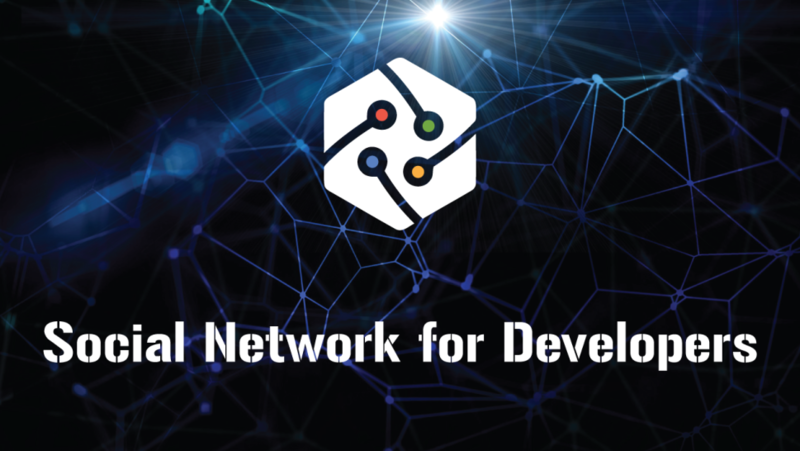 So, we want a one-to-many relationships between our models. By default, Sequelize will use a camel case name from the corresponding model name and its primary key as the foreign key. So in our case, it will expect the foreign key to be UserId. Since we named the column differently, we need to explicitly define the foreignKey on the association. Apollo Server requires graphql as a dependency, hence the need to install it as well. Also, we install bcryptjs, which we’ll use to hash users passwords later on. Here, we create a new instance of Apollo Server, passing to it our schema and resolvers (both which we’ll create shortly). We also pass the models as the context to the Apollo Server. This will allow us have access to the models from our resolvers. Finally, we start the server. GraphQL schema is used to define the functionality a GraphQL API would have. Basically, a GraphQL schema is comprised of types. A type can be for defining the structure of our domain specific entity. In addition to defining types for our domain specific entities, we can also define types for GraphQL operations, which will in turn translates to the functionality a GraphQL API will have. These operations are: queries, mutations and subscriptions. Queries are used to perform read operations (fetching of data) on a GraphQL server. Mutations on the other hand are used to perform write operations (inserting, updating or deleting data) on a GraphQL server. Subscriptions are completely different from these two, as they are used to add realtime functionality to a GraphQL server. We’ll be focusing only on queries and mutations in this tutorial. createUser(name: String!, email: String!, password: String! ): User! First, we pull in the gql package from apollo-server. Then we use it to define our schema. Ideally, we’d want to our GraphQL schema to mirror our database schema as much as possible. So we define to types: User and Recipe, which corresponds to our models. On the User type, in addition to defining the fields we have on the User model, we also define a recipes fields, which will be used to retrieve the user’s recipes. Same with the Recipe type, we define a user field, which will be used to get the user of a recipe. Next, we define three queries; for fetching a single user, for fetching all recipes that have been created and for fetching a single recipe respectively. Both the user and recipe queries can either return a user or recipe respectively or return null if no corresponding match was found for the ID. The allRecipes query will always return a array of recipes, which might be empty if no recipe as been created yet. Lastly, we define mutations for creating and new user as well as creating a new recipe. Both mutations return back the created user and recipe respectively. Tips: The ! denotes a field is required, while  denotes the field will return an array of items. We start by creating the resolvers for our queries. Here, we are making use of the models to perform the necessary queries on the database and simply return the results. The createUser mutation accepts the name, email and password of a user, and creates a new record in the database with the supplied details. We make sure to hash the password using the bcrypt package before persisting it to the database. It returns the newly created user. The createRecipe mutation accepts the ID of the user that’s creating the recipe as well as the details for the recipe itself, persists them to the database and returns the newly created recipe. These uses the methods (getRecipes() , getUser()), which are made available on our models by Sequelize due to the relationships we defined. 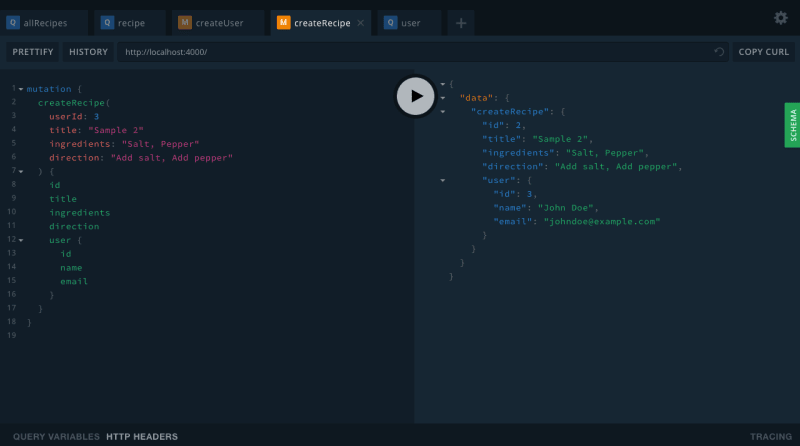 direction: "Add salt, Add pepper"
In this tutorial, we looked at how to creating a GraphQL server in Node.js with Apollo Server. We also saw how to integrate a database with a GraphQL server using Sequelize.